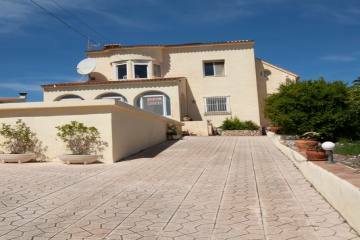 For sale, this fantastic well maintained townhouse situated in a cul de sac in the desirable urbanisation of Los Olivos in Benitachell. This property consists of an entrance door coming into the main spacious and bright living room with a sunny balcony overlooking the saltwater kidney shape pool. A modern open plan kitchen with a separate glazed terrace/dining area. The dining room has a door that opens to an outside staircase leading to a fabulous roof terrace with fantastic panoramic views and views toward the Montgo. This staircase also leads down to the communal garden and pool area. Also on this main level, you have the master bedroom with beautiful views over the pool, fitted wardrobes and a large bathroom with a shower. Internal steps leading down from the living room to the ground floor where you find 2 double bedrooms and a family bathroom with a bath, laundry room and storage space. Parking space for two cars. This townhouse also benefits from double glazing and underfloor heating. Close to services and schools.